This got an 83% fresh on RT, but I wasn't feeling it to that extent. It felt like a really uneven mixture of mumblecore, indie film-isms, and 80s nostalgia. YMMV, of course. It has Chase Williamson (John Dies at the End) and another guy going for the kind of Clerks smartass repartee vibe and not quite nailing it. Then there's some awkwardly worked in heavy stuff about alcoholism. Then there's the 80s cheeseball factor/VHS fetishism. And there's the most naked Suspiria/Goblins/Tubular Bells ripoff soundtrack since Waxwork. I'm really not convinced it all held together, but I'd bet some folks will dig it much more than I did. BUT, it also has Barbara Crampton doing some first class Barbara Crampton-ing as the spooky presence who lives in the VCR board game. Based on that alone, I am not sorry I watched this, even if I cannot say it was very good. Watched this recently...While I'm not typically a big gorehound I appreciated the over-the-top gore when it came, probably just because it spiced up what I felt was a good premise (horror Jumanji!) which could have used a lot more imagination in the execution. Of course there were probably big budgetary limitations stifling those possibilities, but still...I just kept thinking that it could have been so much nuttier. 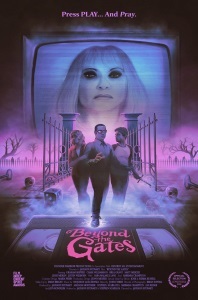 I guess my big complaint about this movie is that, for a movie built around a haunted VHS board game, it seemed to have lost interest in its own premise about a third of the way through. Yeah 83% is way too high for this film. The premise is great, but they spend so little time actually playing the game that it doesn't exactly feel like a life or death situation. Even after people die the characters don't seem particularly concerned or worried enough to focus on the game. I have to watch this, if only because it's a ripoff of/tribute to the WONDERFUL Atmosfear/Nightmare.